This is Part 2 of the New Coke Case Study. It is highly recommended that student groups undertake the New Coke Case Study (Part 1), which sets the marketing environment context for Coke’s decision back in 1985. While the first part of the New Coke case gets students to role play the decision and to consider what other marketing strategies might have been appropriate at the time, this 2nd part of the case gets students to consider if and how they would launch a new cola product into the marketplace. Please refer to the New Coke Case Study (Part 1) for more instructions on how to structure the groups if you do not have groups of six students (which are needed for the role play participants). There is also a collection of useful New Coke and Cola War videos on this site as well. Let’s assume that among the marketing strategy solutions for Coca-Cola in 1985 was the strong consideration of introducing a new cola product (in some form) in the marketplace. As we know, Coca-Cola did in fact reformulate their flagship Coke product and relaunch it in 1985 – but was that the right decision? Now it’s your turn to determine what would be the best product mix for the Coke brand, given the competitive marketing environment in the soft drink market of 1985. Plus the new Coke formula was cheaper to manufacture, which would add up to a $50m pa increase to the bottom line. Coca-Cola’s management believed that the introduction of New Coke would completely destroy Pepsi’s competitive strategy. In fact, Pepsi’s own management initially believed that this was a masterstroke by Coke. Firstly, the New Coke product was to be positioned as new, exciting, modern and young; directly confronting the “Pepsi Generation” campaign and stealing Pepsi’s market positioning. Secondly, the New Coke product tasted better which would stop the Pepsi Challenge taste-test advertising. In fact, Coke had plans to run their own taste-tests and run their own TV commercials in order to win back lost customers. Therefore, you can see why Coke’s management was so confident, as they believed that they had boxed Pepsi into a corner and destroyed their competitive strategy, as highlighted in the following perceptual map. Your group needs to consider whether if and how Coca-Cola should launch a new product or whether there are better non-product solutions to their competitive battle with Pepsi. 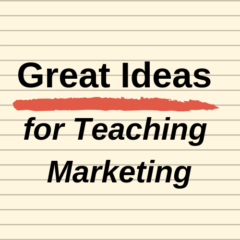 Here are the different approaches to a new product to consider and discuss in your groups. Note: Remember to discuss these question in the role play scenario; please see the other New Coke Case Study for participant role descriptions. From the above list, what would be the best option for Coke to pursue in 1985? If you decided to introduce some form of new product, how would you position the new product relative to both Pepsi and any remaining Coke products? 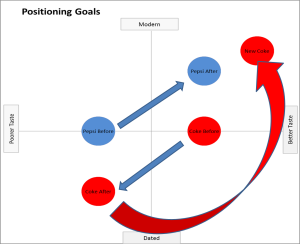 If you decided to reposition the Coke brand or Pepsi, outline your positioning goals. If you decided NOT to modify the product mix, outline why this approach would be successful given that Coke has already implemented many of these marketing tactics.